Wild: Paraceratherium Gigamicus is a massive, long-necked mammal that inhabits some of the island's grasslands. It resembles a gigantic horse/rhinoceros hybrid, but is over twice the size of either. 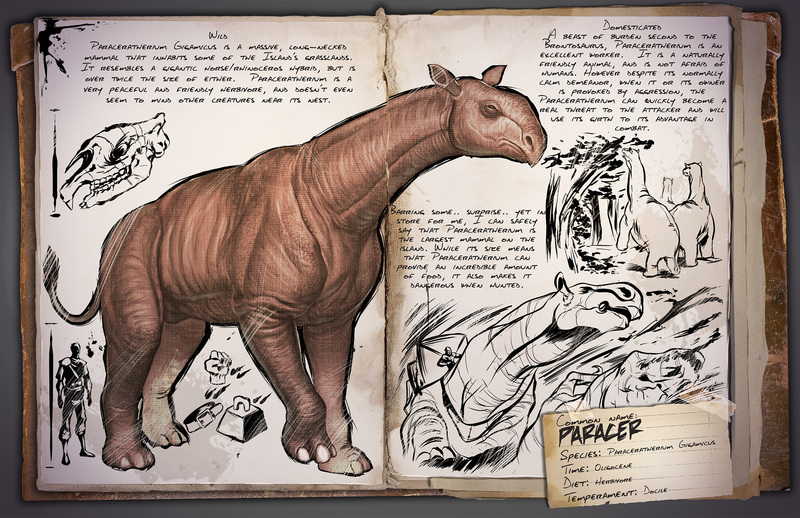 Paraceratherium is a very peaceful and friendly herbivore, and doesn't even seem to mind other creatures near its nest. Domesticated: A beast of burden second to the Brontosaurus, Paraceratherium is an excellent worker. It is a naturally friendly animal, and is not afraid of humans. However despite its normally calm demeanor, when it or its owner is provoked by aggression, the Paraceratherium can quickly become a real threat to the attacker and will use its girth to its advantage in combat. Known Information: Barring some... surprise... yet in store for me, I can safely say that the Paracerathrium is the largest mammal on the island. While its size means that the Paraceratherium can provide an incredible amount of food, it also makes it dangerous when hunted.